Winters in northern Minnesota are cold. Really cold. So when Annalisa built their new home, they used double-wall construction to help it be as energy efficient as possible. They also chose an IKEA kitchen to make her home feel as warm and inviting as possible. 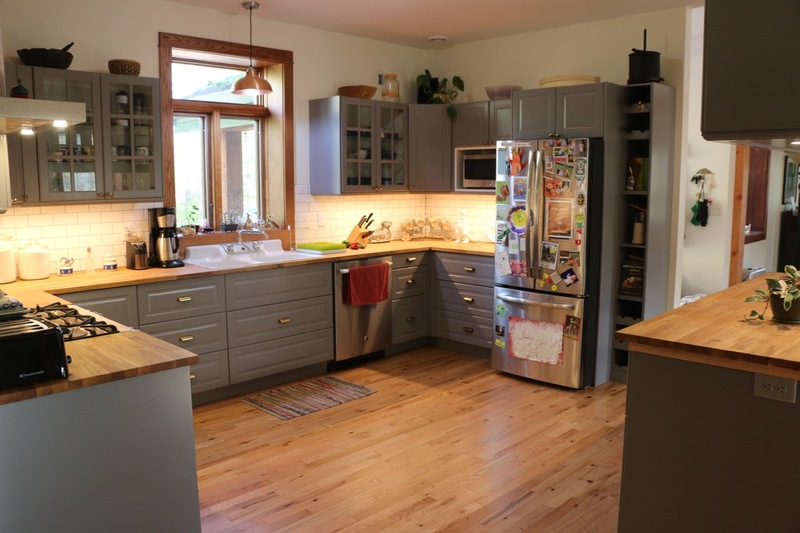 As Annalisa put it, “We know what we like, but we’re not design people.” So she chose BODBYN doors in gray and butcher block countertops for a classic kitchen feeling. 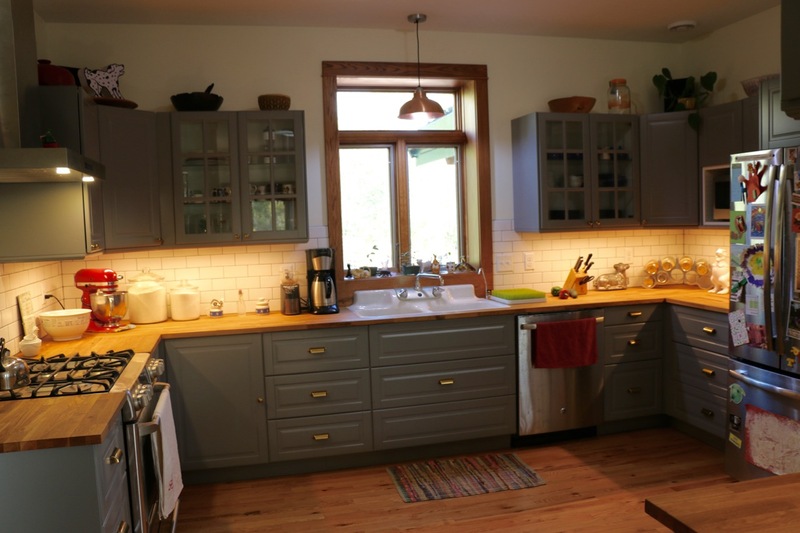 And then she hired IKD to help her design a kitchen with great flow that incorporated several non-IKEA elements. When you are “massively” pregnant, as Annalisa says she was during the design and installation process, the last thing you want is to make multiple trips to IKEA because of mistakes in your design file. Let’s see how this worked out for her! A regret-free kitchen. Annalisa wanted the professional expertise of kitchen designers to help her avoid mistakes in her design. She wanted to prevent putting doors in places where they wouldn’t open, or stay away from dangerous design mistakes like not providing enough countertop support. Enter IKD. A smart workflow. Kitchen cooks needed to be able to work together and stay out of each other’s way. And of course, the kitchen needed to look great while doing it. A classic kitchen that brought in shelves, a magnetic chalkboard, a special vent hood for their energy-efficient home, and other items that the IKEA kitchen planner app can’t add. Every kitchen needs a great focal point. Instead of just a regular kitchen island, IKD designed something kind of different. 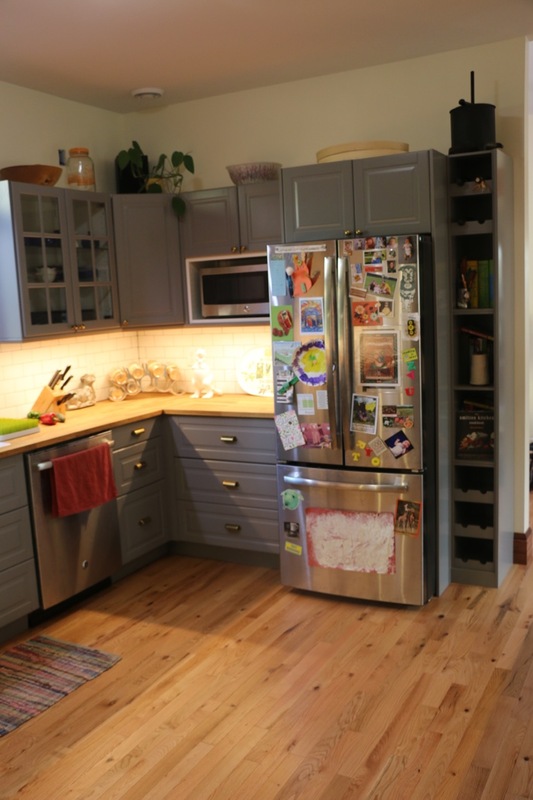 In addition to the extra counterspace, the kitchen also gains extra storage. While the cabinets face into the kitchen, guests can sit on the other side and still feel connected to their hosts. The bottom cabinets have shelves instead of drawers. The cabinets hanging above create the feeling of a hutch or china cabinet because of their glass doors on both the front and back of the cabinets. Those 3 stools were a lucky find by the side of the road. Annalisa’s new home needed a special type of vent hood because of the way it was built. The double-wall construction prevents heat loss, so the only way the moisture from a boiling pot of spaghetti could escape without opening windows is if the hood is turned on. To the right of the refrigerator, HORDA wine cabinets are combined with regular cabinets to store wine and catch clutter before it ever hits the countertop. Annalisa’s favorite part of her new IKEA kitchen is the recycling and waste cabinet underneath the sink. Everything is so neatly hidden away. Spoiler alert: this story has a happy ending thanks to a very dedicated IKEA employee. Buying your IKEA kitchen over the phone seems like it would make a lot of sense. Avoiding crowds and lines? Sounds great! Well…if you’ve read our post about the perils of ordering your IKEA kitchen online you’ll learn why it’s always best to go to the store (no matter how painful it may be). Unfortunately for Annalisa, a phone purchase was the only option for her to buy her IKEA kitchen. She was pregnant and unable to make the 6-hour roundtrip drive to the nearest IKEA. Unfortunately, IKEA sent the wrong sizes of the butcher block countertop she had ordered. Annalisa emphasizes that IKD’s list was right, it was IKEA’s mistake and they admitted it. But, IKEA couldn’t send replacements because IKEA had a shortage of that model of butcher block, and there were rumors the line had been discontinued altogether just after she ordered it! 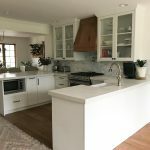 Annalisa, thanks so much for sharing pictures of your finished kitchen! We hope it keeps you and your family warm all winter. 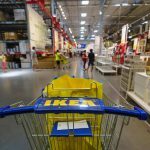 Just a reminder: the IKEA kitchen sale is currently live! You can get 15 percent off your kitchen (see the IKEA website for details) until November 19, 2017. Don’t wait to get started on your kitchen design!